Now bear with me here, because this post is about kale. Not the stuff used to line salad bars, (however I do think that's edible too) and not the pretty purply stuff that you put in your outdoor pots in the fall. 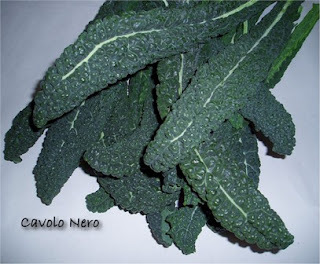 But good eatin' kale, like Cavolo Nero, a delicious Tuscan variety. It is also sometimes called dinosaur kale. I guess because its leaves are bumpy like dinosaur skin might be (?). It is easy to find in most supermarkets now. This is some really tasty stuff, not strong tasting like mustard or collard greens. It makes a hearty and warming side dish for this time of year and you can't beat it in terms of health-giving nutrients. The braising isn't a long process because this isn't terribly tough. And you can taste it along the way until it is tender to your liking. Below is a great recipe to start with if you haven't tried kale before. There is lots of supporting flavor of garlic, sun-dried tomatoes and a splash of balsamic at the end to give it a little zing. I frequently leave off the goat cheese if it doesn't go with the other things on the plate. But I could easily see this plated on top of creamy polenta and topped with the goat cheese for a fab vegetarian meal. Especially with some marinara sauce pooled around, yum! This day I served with a small piece of swordfish (done mediterranean-style with herbs and lemon) and half a roasted acorn squash. But the kale was the star of the show. Braising softens kale, which will be a little tough and leathery if undercooked. Unfortunately, kale also loses its bright green color when properly cooked. As a variation, try using the pretty new variety of kale called cavolo nero, or Tuscan kale, in this recipe. Or use young turnip greens. You can also vary this recipe by sautéing onions or bacon with the garlic, or by adding red pepper flakes.Serves two as a side dish. Heat the olive oil in a Dutch oven or a 3- to 4-qt. soup pot over medium heat. Add the garlic and sauté, stirring, until starting to brown, 2 to 3 min. Add the sun-dried tomatoes and stir to combine. Add the kale, tossing to coat it well with the oil. Season with the salt and a few grinds of pepper, and continue stirring until all the kale is wilted. Add the stock, bring to a boil, reduce to a simmer, cover and cook until the kale has softened, about 8 min. Uncover, turn the heat to high, and boil away the remaining liquid, stirring frequently, until the pan is almost dry. Take the pan off the heat. Season with the vinegar and stir to combine. Transfer to a small serving dish or plates. Top with the crumbled goat cheese, if you like. I love kale. I've been on a kale binge lately. Dino kale is definitely my most favorite kale. I had never thought of that dish as a veggie entree, but you're right. It would be great over a big heap of creamy polenta. That quick one with goat cheese that I'm always making! Toni, This is a beautiful meal, I love your plate presentation. I've never had this kind of kale, but I'll be on the hunt for it. You sold me on it!